Under their new leader, the Babylonians prospered, and employed their innovations in the arts of writing and counting to advance astronomy. They kept detailed records of planetary motion, observed the comet that would eventually be called Halley's, and discovered subtle patterns of lunar movement. The Moon follows various cycles depending on one's point of view. The synodic month from one full moon to the next is about 29.5 days, the anomalistic month between perigees is about 27.5 days, and the draconic ... well, it's complicated, and Greek scientists needed a computer to sort it all out. The Babylonian scientists noticed that these cycles interact to form a pattern that repeats every 18 years, 11 days, and 8 hours. Therefore, when the Earth and Moon happen to line up with the Sun, causing a solar or lunar eclipse, it is possible to predict another similar eclipse later on. Halley would call this cycle the Saros, borrowing a term from the Suda, the Wikipedia of the Byzantines. Solar Saros 145 began with a partial solar eclipse in 1639. 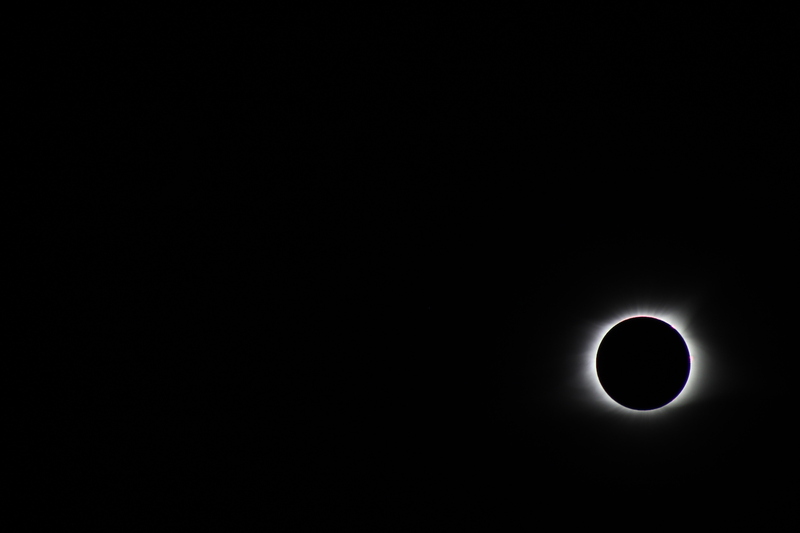 Eighteen cycles later, in 1963, a Saros 145 total solar eclipse crossed North America from the Pacific to the Atlantic coasts, mostly over Canada. Peanuts ran a series of eclipse-themed comics in the week leading up to the July 20 event, with Linus warning of "severe burns of the retina" if anyone looked at the eclipse. The next Saros 145 eclipse, in 1981, passed over the Soviet Union, with little fanfare (the extra eight hours in each cycle give the Earth time to turn a third of the way around). Then, on August 11, 1999, at the end of the millennium, the great Y2K fin de siècle total solar eclipse passed over the U.K., Europe, Turkey, Iraq, Iran, Pakistan and India, promising the end of the world or something. I went to Paris to try and see it, and had a nice trip, but the weather made my eclipse viewing experience little better than that of Linus. Fast-forward eighteen years, eleven days, and eight hours, and the Moon was destined to cast a shadow on North America once again: the Great American Eclipse. The date has been noted on the various calendars I have kept since 1999. 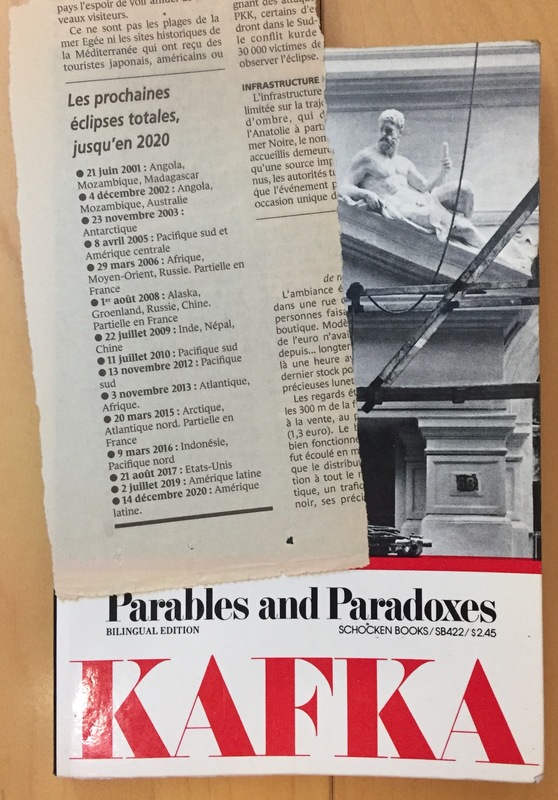 I still have a clipping from Le Monde I tucked into a book I was carrying on that trip. Only recently, however, did I become aware of an opportunity to get a mega-dose of science on 21 août 2017. 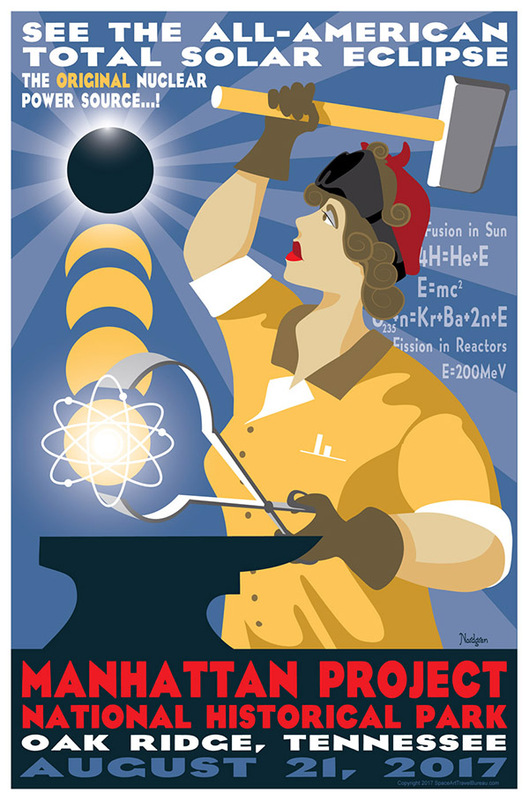 I had driven past Oak Ridge, Tennessee on two trips to the BFC, and recognized it from Richard Rhodes as one of three important Manhattan Project sites. 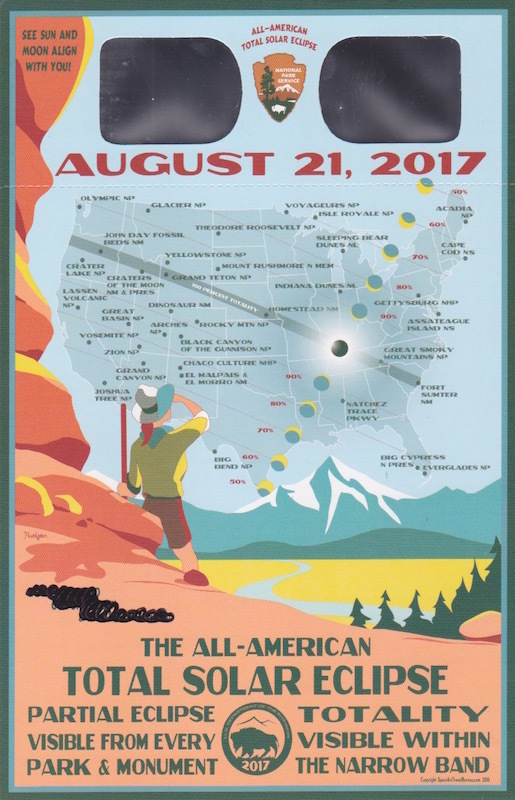 I reserved a seat on the Oak Ridge National Laboratories public bus tour at the American Museum of Science and Energy which would make a special stop in the afternoon for the eclipse. It was easy to pass time in the AMSE until the tour started. There were dollhouse reactor models, many artifacts, and a photo of Oppenheimer on almost every wall. I took a picture of a Norden bombsight and sent it to John Coster-Mullen, who had kindly given me sightseeing tips when I visited the Navy Museum. 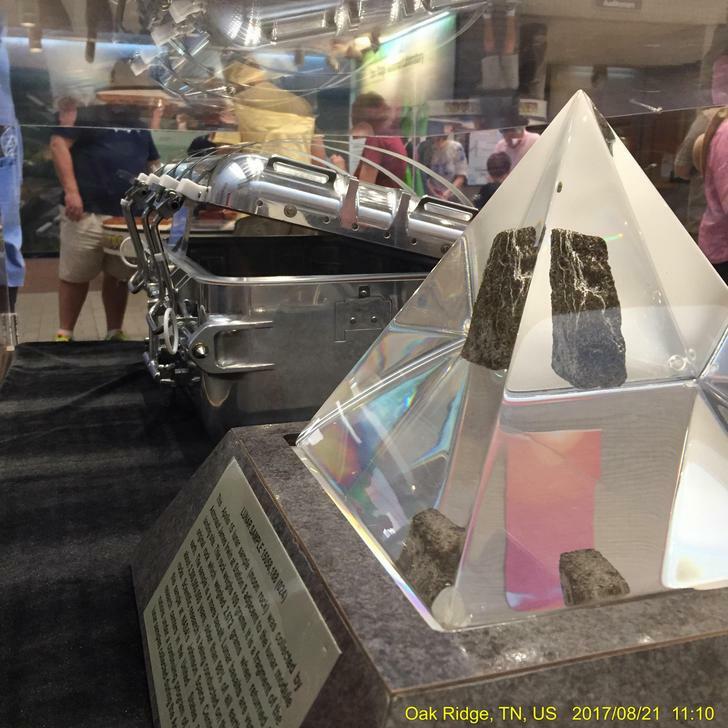 Union Carbide, a primary postwar Oak Ridge contractor, created Apollo Lunar Sample Return Containers, and a moon box and chunk of moon rock were on display. I visited the museum shop to buy a gizmo for the kid and a National Park Service passport book because it seemed easier than starting a patch collection. Now I am obligated to go to Los Alamos and Hanford. Once on the bus I took a seat next to Jarrod, a nuclear power worker who had brought his wife and daughter from Ohio. He was, like me, avidly consuming the Manhattan Project lore, but also carried a new DSLR with a big lens for the main event in the afternoon. 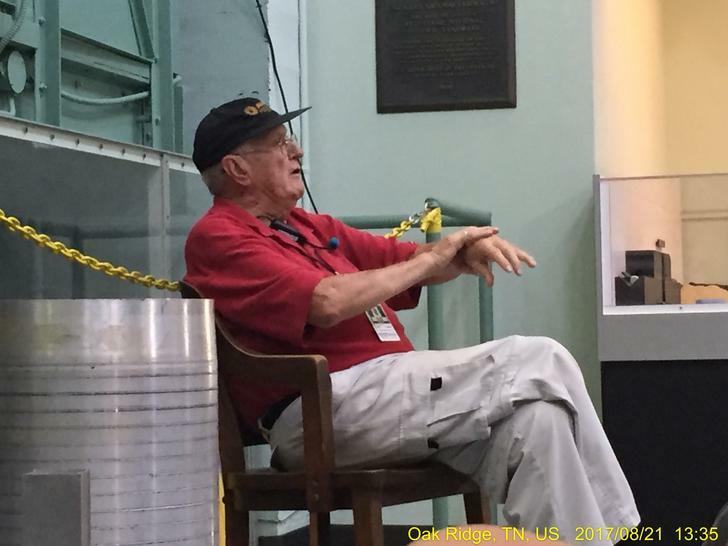 Our tour guide, Richard Raridon, worked for 30 years in the computing division at Oak Ridge and kept us entertained with stories from the old days. The first stop was Y-12, where giant calutrons separated the lighter uranium isotopes needed for fission by projecting them through a magnetic field. Generating this field in so many machines would require thousands of tons of copper, which was in short supply during the war. Mr. Raridon told the famous story of the engineer meeting with the deputy secretary of the U.S. Treasury, asking to borrow silver to use in place of copper. "How much do you need?" "Six thousand tons." "Young man, you may think of silver in tons, but the Treasury will always think of silver in troy ounces." So goes the lore. They eventually borrowed over a billion dollars' worth of silver for the project, and Mr. Raridon pointed out that the busbar going around the top of each calutron "racetrack" was a solid silver conductor about a foot thick. We next drove past the Spallation Neutron Source, a modern peacetime project that provides neutron beams for industrial and scientific research. 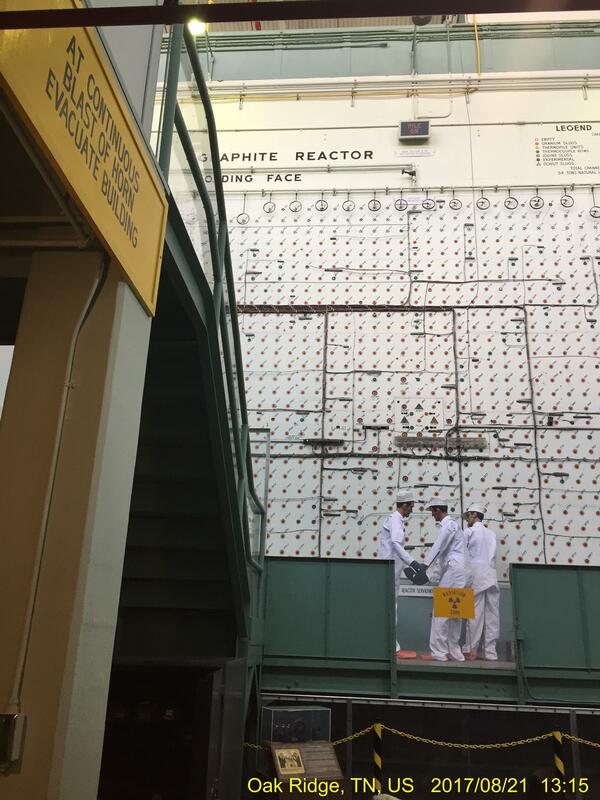 Then the X-10 Graphite Reactor, the world's second atomic reactor and a demonstration for the later wartime production of plutonium in Hanford. Finally we got back on the bus for the ride to K-25, the giant, mile-long building that enriched uranium by the gaseous diffusion process. Larger than the Pentagon, and the most expensive component of the Manhattan Project (which sent only 4% of its budget to Los Alamos), it was constructed in less than two years and took five years to demolish, finishing in 2013. Oak Ridge facilities consumed about one percent of the nation's electric power during the war. The museum arranged for a stop at the K-25 site, now a vast paved area with scattered commercial industrial buildings around, to view the eclipse, and we arrived about 20 minutes before the 2:32:42 p.m. show time. I closed one eye as I got off the bus to develop some dark adaptation. I set up my cheapo sports camera on a pocket tripod and checked the framing to include the bus and some landscape and the sun, still quite bright and high overhead at 64° altitude. 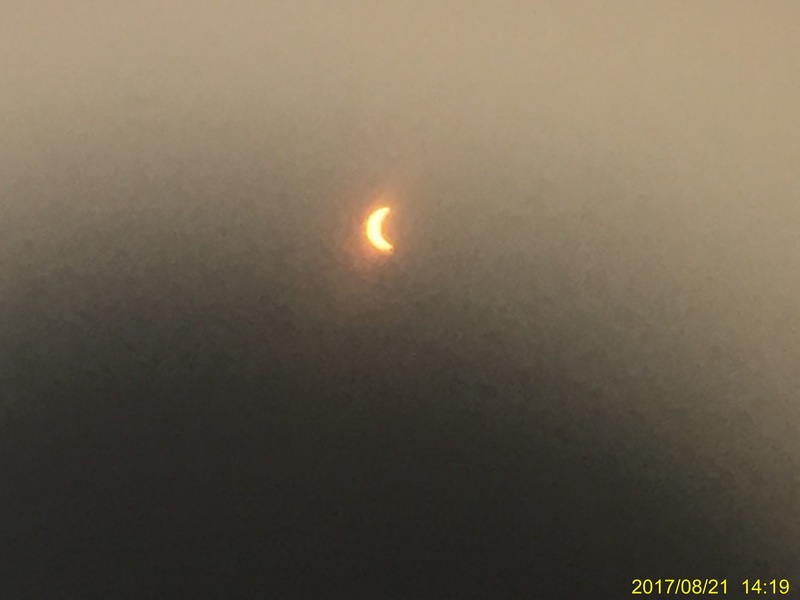 I set out my binoculars and took a few glances at the crescent sun through the eclipse glasses. My plan for my first, and possibly only, total solar eclipse viewing was to just take in the experience and not futz around with gadgets. But fifteen minutes turns out to be a long time to stand around waiting. I took a shot through the glasses with the phone to see how it would come out. Grainy. I went back to check the framing of the camera again, and noticed that I did not start the recording, so I did that. I checked my bearings with the compass app and kept an eye out to the west. It was getting darker, but not dramatically, probably because light perception is logarithmic. People reported that it got cooler, but I didn't notice in my building excitement. During the last minute, I noticed a ridge of dark clouds at the western horizon that had been invisible against the bright sky moments earlier. The sun was a thin crescent through the glasses now, but I wasn't going to look for the "diamond ring" or "Baily's beads" effect at the beginning, to try and preserve dark adaptation. A nearer cloud in the western sky turned gray, and then we were in the dark. It was an immense moment. The familiar eclipse image was hanging up there where the sun was a moment before. I gawked and lost my composure. This likely has more to do with two decades of planning and anticipation and worry being consummated all at once then any majestic grandeur of the scenery. After all, we knew what it was going to look like. Oppenheimer said that badass Sanskrit line when he saw the first atomic fireball, and I had considered memorizing some cool Latin phrase for deployment at the right moment, but didn't bother. Obviously Oppie knew he was going to say that, and he knew he was later going to be interviewed and say that he had said that. I didn't have an audience, so my exclamations were more profane than profound. I got a few WTFs out of the way and pulled myself together to make the most of my one minute forty-three point three seconds of totality. Through 10× pocket binoculars, the corona was majestic, with fine texture visible in few eclipse photos, stretching and curling farther than one diameter away from the edges. I didn't notice any features of the moon's surface but didn't think to look carefully, nor did I see any prominences. 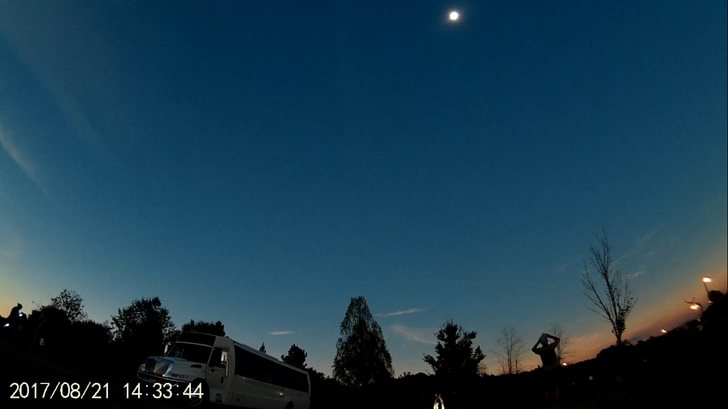 A tiny star was visible at ten o'clock to the eclipse, apparently Regulus. Other stars or planets were easily visible in the dusky sky, but I didn't waste time trying to identify them. I gawked through the binoculars then gawked with naked eyes then gawked again through binoculars. Then I put the binoculars down and looked all around, at the sunset-red atmosphere along the horizon in every direction. There were some voices but most of the sound came from the idling engine of the tour bus. Jarrod was leaning over his tripod, bracketing like mad. I checked the "3425" mm:ss notation I had scribbled on my palm, then my watch, and saw we had just over a minute to go. I looked back up. The sky was broken. There was a black hole where the sun was supposed to be. It was deeply unsettling. Come back, sun, I murmured. I don't believe the ancients were all so puzzled by total solar eclipses. When the sun and moon are your clock and calendar, it's pretty simple to work out where the invisible new moon is, and pretty obvious in the days after an eclipse that the moon was in the right place at the right time, even if you can't pin down a motive. But I fully understand how they saw an eclipse as an ill omen, unnerving as it is to see the sun blotted out. I took another long gaze through the binoculars, savoring the experience of looking directly toward the sun through magnifying lenses. Then I watched the last seconds unassisted. I don't want to diminish the importance of the widely-dispensed advice about ocular health, but it was quite easy to look away shortly after the diamond ring appeared and from then on use protective filters. As the sky brightened, the eclipse was about 51% complete, but I was already thinking about the 500-mile traffic jam rapidly forming between me and a 10 a.m. meeting at work Tuesday morning. Our tour group loitered around a while, and finally boarded the bus. On the road back to the museum, a line of about 20 cars formed at a red light, and Donnie the driver said it was the worst traffic since the  World's Fair. Someone had asked about some pool, so we made a detour to drive by the Oak Ridge Outdoor Pool, now or then one of the largest in the world, or the southeast, while I frantically tried to download traffic data over the overburdened cell network. The drive home was fine. I managed 70 mph most of the time, with typical slowdowns for accidents and construction giving me an average 59 mph speed over 378 nonstop miles, surely my personal best for distance. It rained some too. I don't like to recommend things; inflating expectations seems to promote disappointment more than anything else. But I do suggest we say yes to opportunities to have new adventures whenever possible. Just days before the event I was only half sure I would go, with fears of car trouble or traffic nightmares or bad weather giving me doubts. For the price of a motel night and two tanks of gas, I formed memories that I will enjoy in my last days, if they are not crowded out by greater experiences. Saros 139 is just around the corner, with more to come. Thanks to Lee and cW for live previews from the West Coast, also to ButterflyEffect and am_Unition for online companionship from Tennessee though we were, regrettably, unable to meet in person. Tigercodes.in is a coupon database. We are a niche site for people who want to find the best coupons and promo codes. You went to Oak Ridge for the eclipse?! That's a helluva two-for-one deal! That's what I thought, who could miss that? some great wikipedia pages on human perception, thanks.